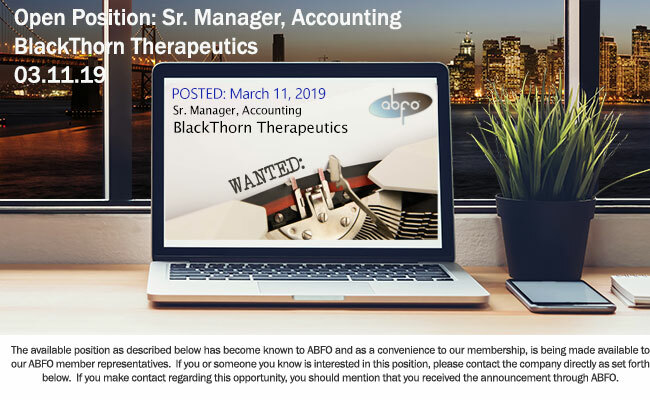 The Senior Accounting Manager will serve as a key member of BlackThorn Therapeutic, Inc.’s (“BTRX”) Finance function. Reporting to the VP, Controller, the role will oversee daily operations of the accounting team, provide technical accounting expertise, ensure the accuracy and integrity of financial data, and assist in the design and implementation of processes and policies. Oversee compensation process including payroll and share-based compensation. Responsible for working with Senior Manager, Finance, legal team, and external stock plan administrator to record and reconcile equity activity with a goal to move outsourced processes internally in 2019. Become subject matter expert on foreign currency transactions, drug & software development processes, and share-based compensation. Develop, improve, and assist in training others on company-wide policies and procedures to ensure adherence to US GAAP and a strong internal control environment. Manage or assist with functional areas including, but not limited to, procurement, accounts payable, equity, clinical trial accruals, fixed assets, treasury, and tracking of software development costs. Assist Controller in researching and implementing complex accounting and compliance matters and prepare accounting memorandums/process documents to support conclusions. Partner with FP&A to prepare and deliver quarterly financial statements to external parties as well as develop and track company actual results against budgets and forecasts. Assist Controller with external audit and outsourced tax firm. Prepare key schedules and other support for annual audit. Ability and desire to work in a fast-paced, exciting environment.